We managed to pack a mountain of tone flexibility into this 27” x 17” system, MIDI Controlled Buffered & True Bypass system. Starting with the Harmonics section of the system. The Chase Bliss Audio Brothers OD/Fuzz/Boost has 122 user presets in it’s local memory. Multiplied by the 3 internal routing options gives the user 366 different OD/Fuzz/Boost combinations. By stacking the Tribute Audio Designs Classy Lady or Xotic Soul Driven with the Brothers, the user has over 1000 different Harmonic stacking options at their disposal. We modified the Classy Lady & Soul Driven with click-less relay kits that can be remotely controlled by the RJM Music MasterMind LT/7 MIDI Controller’s Function Switches. Effectively making these pedals respond to MIDI so that they can be Activated or Bypassed as part of a system preset. We built a custom buffer circuit with user adjustable values for Output Impedance & Gain. This allows the user to dial in the exact harmonic response they want from the system even though there are other audio devices in line between the pickups and the Harmonic stacking section of the system. 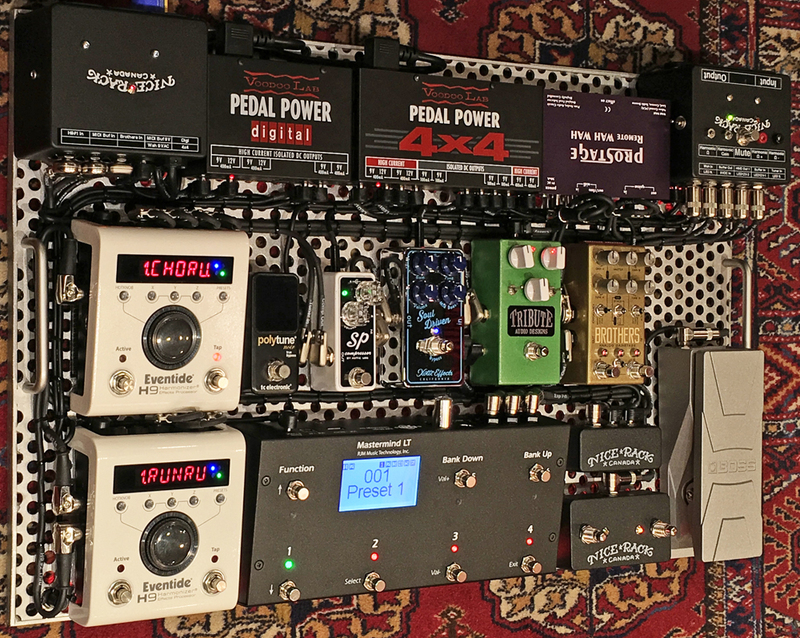 To help keep the footprint as compact as possible, we wanted to maximize the functionality of the Expression Pedal. Using the MasterMind LT/7 the user can assign the expression pedal on a “Per Preset” basis to control the Wah or Volume control presets in the ProStage Remote Wah. Alternatively the expression pedal can be assigned to controlling any collection of parameters the user desires in the 2x Eventide H9’s. By tapping into the parameter control possibilities of the H9, the user has the ability to use a sweepable Volume Control at 5 different places in the signal path depending on the desired signal flow of the currently selected system preset. The first H9 is wired in a “Pre / Post” configuration so that the Effects algorithm can be placed in the signal chain Before or After the Harmonics stage of the system. 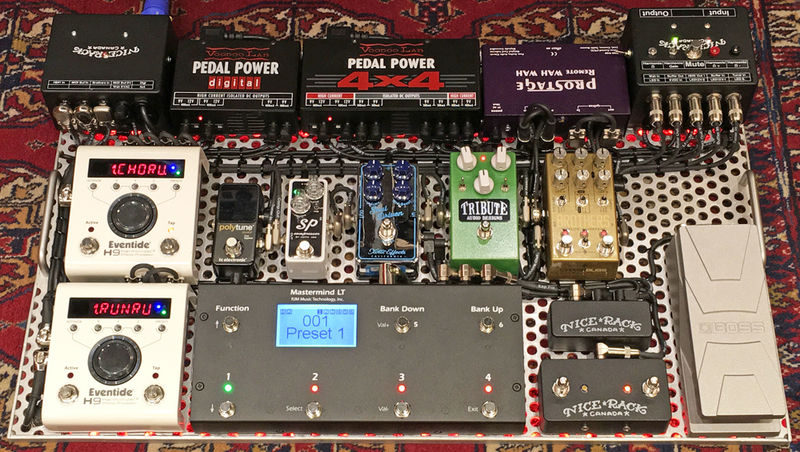 The signal flow is Guitar --> Input Buffer & Tuner Split --> Remote Wah --> H9#1 Pre Connections --> Nice Rack Canada Harmonics Optimizing Buffer --> Brothers --> Classy Lady --> Soul Drive --> SP Comp --> H9#1 Post Connections --> H9#2 --> Mute --> Amplifier. Powered by the original, often imitated and never duplicated Voodoo Lab Pedal Power Digital & 4x4. 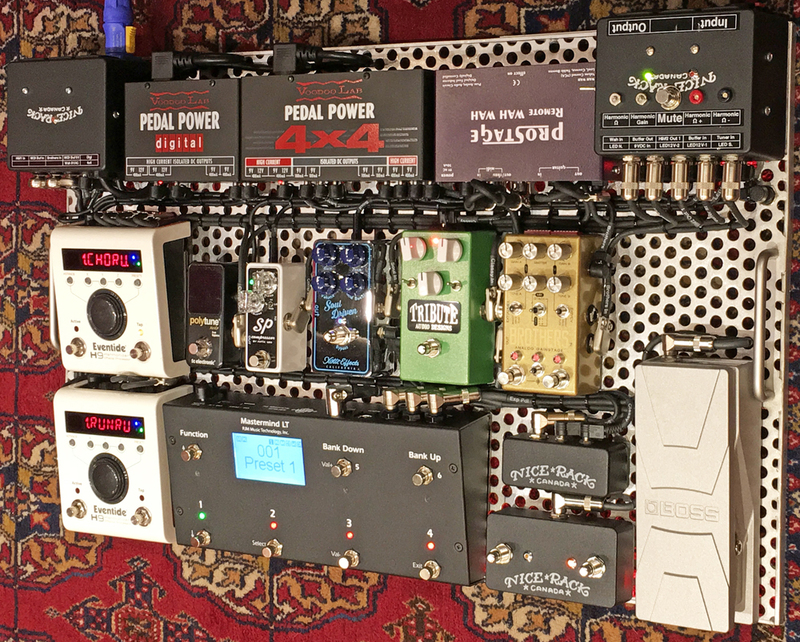 Some of the extra features we built into this system include a custom MIDI buffer for communication with the Brothers, 2 Button External Switch for the LT/7, custom power supply for the Remote Wah, and modifying the Boss FV30L into a linear taper expression pedal. No matter where your tone quest takes you in 2018, Nice Rack Canada can be there for you to make all of your sonic dreams come true. Happy Gigging & Safe Travels to you all!